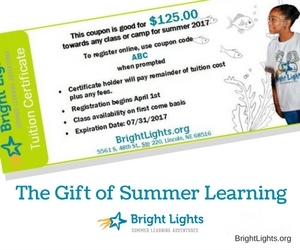 Purchasing a Bright Lights gift certificate is easy. Simply go to Gift Certificates, fill out the form and we’ll send it to you. When our class schedule comes out in March, the student can choose any class they want (they are broken out by grade) and then register for it via BrightLights.org starting April 1.